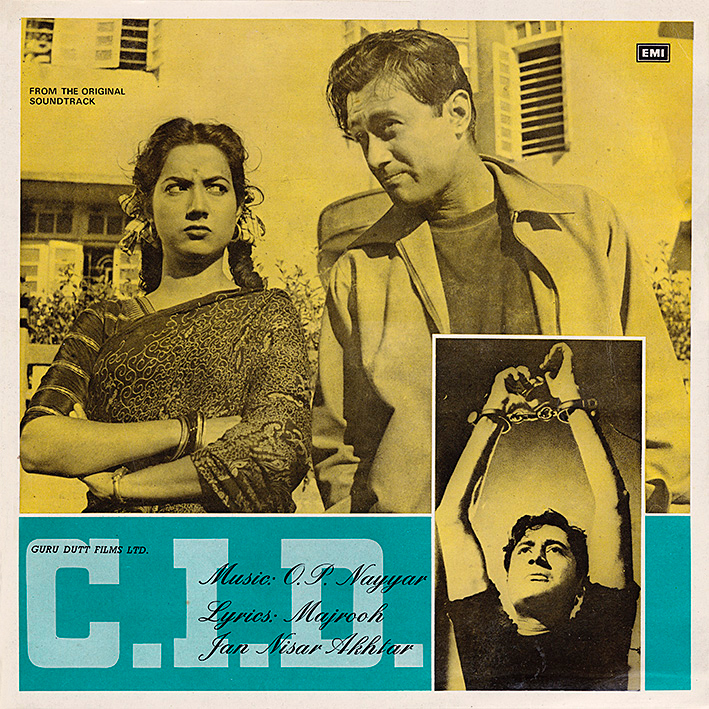 Despite its title, and despite the film being labelled a thriller, the soundtrack to Guru Dutt's "C.I.D." sounds nothing like what I generally associate with crime film music. While I wasn't necessarily expecting a gritty, urban jazz Henry Mancini or Lalo Schifrin type score, it was surprising to find songs as easy-going as on this O.P. Nayyar effort. It's rather nice all the way through, although I'm unable to really pick out highlights; the music sort of floats pleasantly along without any particular tracks nor bits of them sticking out. All were apparently hits. Opener 'Yeh Hai Bombay Meri Jaan' is sweet and curiously rustic sounding, and at the opposite end 'Ankhon Hi Ankhon Men' is similarly bright and cheery. 'Kahin Pe Nigahen Kahin Pe Nishana' and 'Leke Pahla Pahla Pyar' have more of an exotic feel. My favourite is probably the Latin-tinged 'Jata Kahan Hai Diwane', sung by the producer's wife. cool, thanks! what a great birthday present! In that case, Happy Birthday! Geeta Dutt was not the director's sister but his wife! That song you mention is also the one which was deleted from the film. Thanks for the upload though. oops I meant Guru Dutt the producer. Geeta is not related to Raj Khosla the director. You are of course right; duly corrected now. I remembered she was someone's brother but that was Mukul Roy; got them mixed up for a second. Thanks for pointing it out! Yes, Jaata Kahan Hai Deewane is an all time favorite of mine too. I'm pumped for this one! It's like you read my mind! Thank you so much! Your rips are always the best! Also, a belated thanks for sending the book!